Gammastripe offers additional benefits that simple gamma indicator dots do not offer. Gamma stripe labels are a combination of a standard paper box label incorporating a gamma/e-beam indicator panel within its construction. The labels can be printed with your normal product identification information, LOT and batch text using your existing printer. Due to its construction, the gamma panel will not fall off the label as is the case with some secondary applied indicator dots. Gammastripe labels present a much larger visual indication of process and non processed products. Increase in efficiency – One label satisfies two processes. Batch identification and Sterilisation visual confirmation. Huge saving in packaging labour – Secondary gamma indicator labels do not need to be applied. One label carries all product information and incorporates the gamma indicator panel – This ensures elimination of customer complaints for non applied indicators. Improved efficiency as the box label can be pre-printed in house with LOT and Batch information. Gives a much larger visual indication panel for process and non processed identification. Labels can be manufactured for either direct thermal or thermal transfer over printing. No costly additional hardware as the label can be run on your current overprinting box label printer. Manufactured within and ISO9001:2008 accredited manufacturing facility in the UK. Manufactured in compliance with ISO 11140-1:2005 specification. Suitable for both Gamma and e-beam sterilisation processes. Labels can be made to your custom size. Labels can carry your company logo or additional marketing information asserting your product brand awareness. These are self adhesive labels suitable for overprinting that also incorporate a Gamma / e-beam sensitive indicator on them. 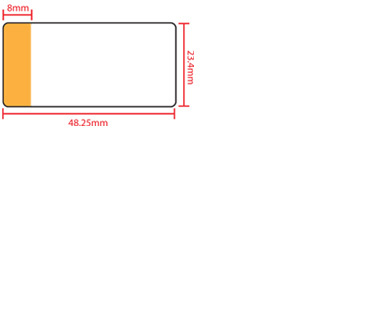 There are 3 standard sizes but large users can have a fully customised design to suit end user requirements. They can also incorporate a company logo for added marketing and standard print information if required. Gammatex now offer a dual Gamma / e-beam indicator incorporated within the convenience of a Direct Thermal or Thermal Transfer printable label. Labels can be provided with pre printed data or supplied to end users as blanks ready for your on demand print requirement. This eliminates the need for secondary label application for sterilisation validity visual recognition where individual lot/batch information is necessary. 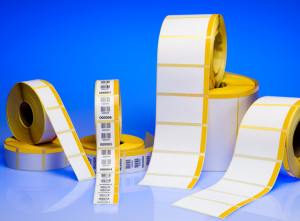 Gamma Stripe Labels are compatible with most thermal printers, and can be applied using automated label applicators. Gamma Stripe Labels can be used as part of the validation process for Quality Control and Inventory processing. 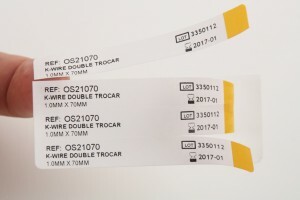 They incorporate an 8mm wide Gamma / e-beam indicator strip that changes from yellow to red beginning at 10 kGy dosage, with a darkening depth of colour as the dosage level is increased.